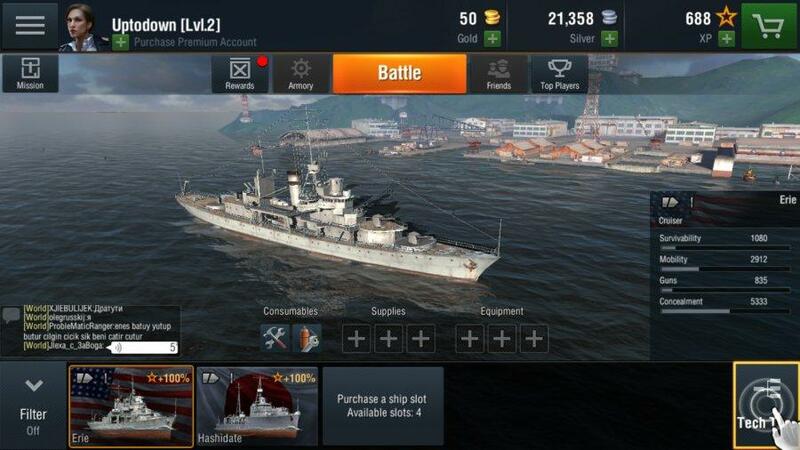 World of Warships Blitz isn’t just your typical shooter. Sure, it’s a game where warships shoot cannons and torpedoes to sink other naval ships, but strategy is as important as accurately hitting targets. If you haven’t started playing it or having trouble winning your games, we’ve compiled a few tips to help you out. There are players, especially destroyers, who blindy rush into the enemy team’s position and go Leroy Jenkins on them. We all know how that ends: they turn themselves heaps of scrap metal on the sea floor shortly thereafter. Even those who use cruisers and battleships immediately go straight into the open sea, exposing themselves to enemy cannon fire and torpedoes. In all your games, be sure to never, ever rush in. If you’re playing as a destroyer, rush into the middle part of the map and immediately turn back. By then, you’ve probably detected a few enemy ships and launched a volley of torpedoes. As for cruiser and battleship users, stay back and pick off enemy ships from a distance and stop those that are charging in. Play smart and you’ll end up winning. Admiral Isoroku Yamamoto orchestrated the attack on Pearl Harbor, and he emphasized surprise above all else. The same can be said in World of Warships Blitz. To do this, simply use the islands scattered around the map for cover, and appear at the right moment when your enemies are at their most vulnerable. Destroyers can be utilized as shock units, circling around an island fire off torpedoes against unwary cruisers and battleships. Battleships are monstrous, and facing them in a war can mean the end of you...unless if you position yourself at the right place. You see, facing the port and starboard side of one is an instant death wish since you will be exposed to its four main turrets, along with its plethora of secondary guns. Instead of attacking it from the side, stay on its front: doing so will keep you away from its devastating firepower. Doing so will only expose you to two of its turrets and a few of its secondary weapons. Plus, the battleships are slow hunks of iron, so it’ll be easy to outmaneuver them. These are available in select cruisers and all destroyers, and they can deal 2,000 hitpoints worth of damage, which is pretty devastating. It’s important to note that though their range is pretty far, it’s not unlimited. See the circle surrounding you on the minimap? That’s how far they can reach before sinking into the bottom of the sea. Instead of launching far off volleys, fire them off at short range to surely hit slow-moving cruisers and battleships. In addition, you have the option to spread them or thin out their trajectory. It would be best to fire a spread when dealing with multiple enemies and do with a thinner trajectory when trying to hit a single unit. This isn’t in the battle part, but in the progression area. You can upgrade your ship’s modules, but instead of using it early on to upgrade tier 1 ships, it’s best to do so when things get grindy when you reach tier 3. By doing so, you can have better-performing ships for the long grind ahead. 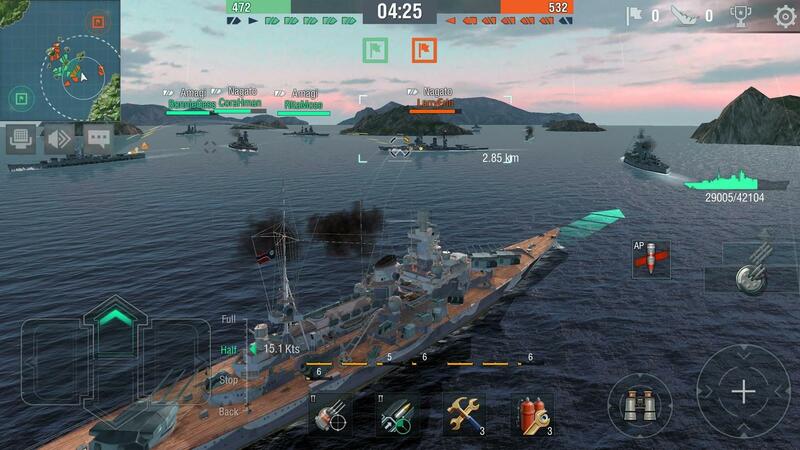 Overall, being a competent captain in World of Warships Blitz involves you not being a hothead and a burden to your team. Control your ships the way they’re designed and use their capabilities to the fullest. Finally, just have fun and do your best in every match.